Is Pilgrim’s Pride Corporation (PPC) Going to Burn These Hedge Funds? Pilgrim’s Pride Corporation (NASDAQ:PPC) has experienced an increase in activity from the world’s largest hedge funds lately. Our calculations also showed that PPC isn’t among the 30 most popular stocks among hedge funds. Let’s analyze the fresh hedge fund action encompassing Pilgrim’s Pride Corporation (NASDAQ:PPC). At Q3’s end, a total of 16 of the hedge funds tracked by Insider Monkey were bullish on this stock, a change of 14% from the second quarter of 2018. 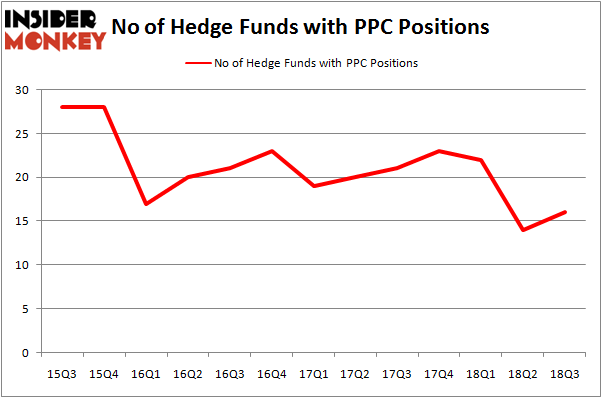 On the other hand, there were a total of 23 hedge funds with a bullish position in PPC at the beginning of this year. So, let’s examine which hedge funds were among the top holders of the stock and which hedge funds were making big moves. More specifically, AQR Capital Management was the largest shareholder of Pilgrim’s Pride Corporation (NASDAQ:PPC), with a stake worth $48 million reported as of the end of September. Trailing AQR Capital Management was Millennium Management, which amassed a stake valued at $16.4 million. Gotham Asset Management, Renaissance Technologies, and Two Sigma Advisors were also very fond of the stock, giving the stock large weights in their portfolios. Consequently, key hedge funds have been driving this bullishness. Gotham Asset Management, managed by Joel Greenblatt, established the biggest position in Pilgrim’s Pride Corporation (NASDAQ:PPC). Gotham Asset Management had $11.4 million invested in the company at the end of the quarter. Matthew Tewksbury’s Stevens Capital Management also made a $0.6 million investment in the stock during the quarter. The other funds with brand new PPC positions are Peter Rathjens, Bruce Clarke and John Campbell’s Arrowstreet Capital and Gavin Saitowitz and Cisco J. del Valle’s Springbok Capital. Let’s go over hedge fund activity in other stocks – not necessarily in the same industry as Pilgrim’s Pride Corporation (NASDAQ:PPC) but similarly valued. We will take a look at Teradata Corporation (NYSE:TDC), Medidata Solutions Inc (NASDAQ:MDSO), Agios Pharmaceuticals Inc (NASDAQ:AGIO), and Associated Banc Corp (NYSE:ASB). All of these stocks’ market caps resemble PPC’s market cap. As you can see these stocks had an average of 19 hedge funds with bullish positions and the average amount invested in these stocks was $265 million. That figure was $106 million in PPC’s case. Teradata Corporation (NYSE:TDC) is the most popular stock in this table. On the other hand Medidata Solutions Inc (NASDAQ:MDSO) is the least popular one with only 14 bullish hedge fund positions. Pilgrim’s Pride Corporation (NASDAQ:PPC) is not the least popular stock in this group but hedge fund interest is still below average. This is a slightly negative signal and we’d rather spend our time researching stocks that hedge funds are piling on. In this regard TDC might be a better candidate to consider a long position. Simcoe Capital Management’s Returns, AUM and Holdings Billionaire Leon Cooperman’s New Stock Picks HMI Capital’s Returns, AUM and Holdings Here is What Hedge Funds Think About Movado Group, Inc (MOV) Is Mohawk Industries, Inc. (MHK) Going to Burn These Hedge Funds? Is MGM Resorts International (MGM) A Good Stock To Buy?